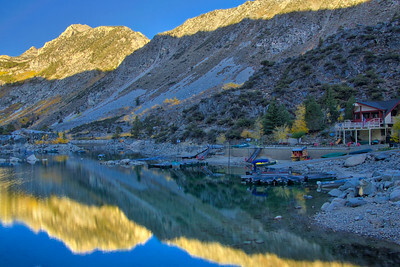 This gallery includes photographs the many beautiful scenic lakes located in the western United States. 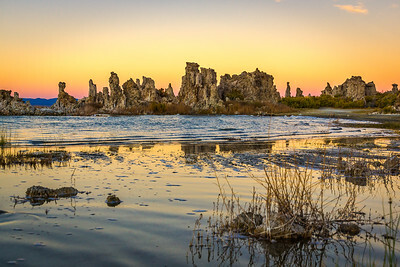 I took this picture of Mono Lake at sunset featuring the spectacular "tufa towers," calcium-carbonate spires and knobs formed by the ​interaction of freshwater springs and alkaline lake water. 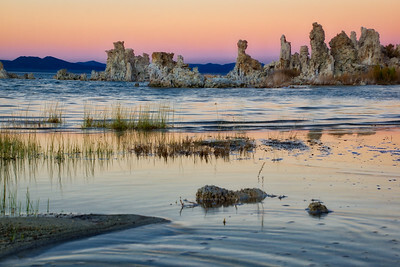 Located in California's spectacular Eastern Sierra, Mono Lake is an oasis in the dry Great Basin and a vital habitat for millions of migratory and nesting birds. 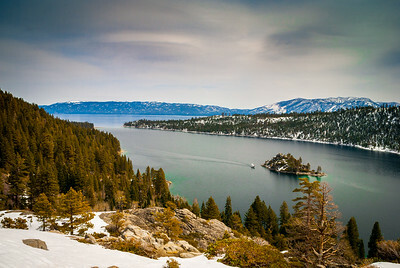 I captured this scene of Emerald Bay looking over Lake Tahoe in late winter. It was a typical winter day with overcast skies. 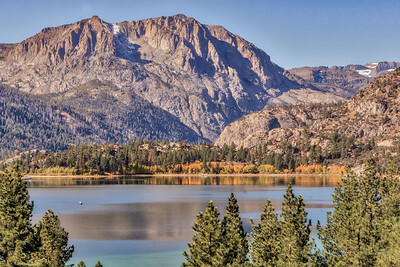 Look down on this astounding bay, ​and you can see why Mark Twain dubbed Lake Tahoe "the fairest picture the whole earth affords." The lake’s west shore takes on a startling and beautiful blue-green, made all the more striking by the perfect dot of tiny Fannett Island seen in this photo. 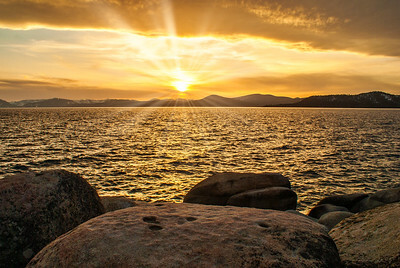 I captured this sunset scene at Sand Harbor, Lake Tahoe. 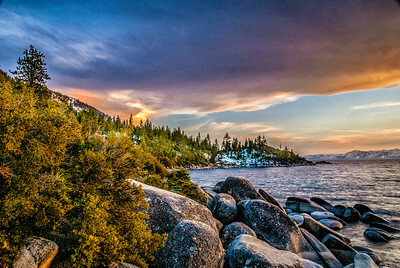 The largest alpine lake in North America, Lake Tahoe is a cobalt blue lake atop the Sierra Nevada mountain range. 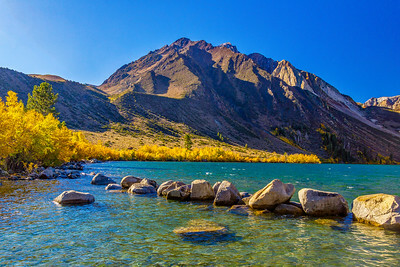 On its eastern shores, gently sloping beaches, crystal-clear water and interesting rock formations allow for wonderfully sublime swimming, kayaking and scuba diving at Sand Harbor. 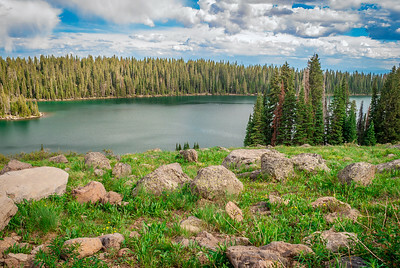 I took this photo of Cottonwood Lake on top of the Grand Mesa located in Western Colorado. This mesa is one of the most massive​ flattop mountains in the world rising more than a mile above the valley floor, which is visible in the background and stretching over 40 miles of Colorado's landscape. The Ute Indians called the Grand Mesa "Thunder Mountain" because of how the mesa towers over the valley 6,000 feet below. 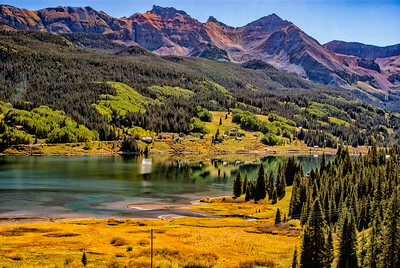 I captured this Gorgeous Lake while driving from Durango to Telluride Colorado on Highway 145, also known as "The San Juan Skyway. 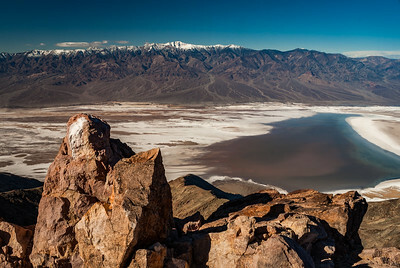 "​ This Scenic and Historic Byway is often considered an essential journey for road trippers. The mountains in the background include San Miguel Peak (13,752ft), Beattie Peak (13342ft), Grizzly Peak (13738ft), and Rolling Mountain (13,693ft). 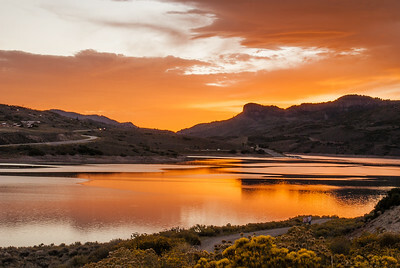 Blue Mesa Reservoir is one of Colorado's must see destinations. It is located in Western Colorado near the town of Gunnison. 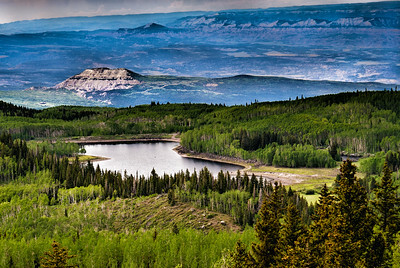 Blue Mesa is Colorado's largest lake being twenty miles long with 96 miles of shoreline. 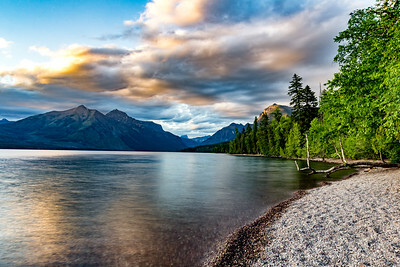 I capture this image on the shore of Lake McDonald at Sunset in Glacier National Park. Ten miles long and nearly 500 feet deep, Lake McDonald, the largest lake in the park, is a direct result of glacial carving. High peaks surrounding the lake all show evidence of the power of glaciers to carve even the hardest of rock. The powerful glaciers that carved the broad "u-shaped" valley that Lake McDonald sits in also carved smaller hanging valleys with wonderful waterfalls that are accessible by numerous hiking trails. 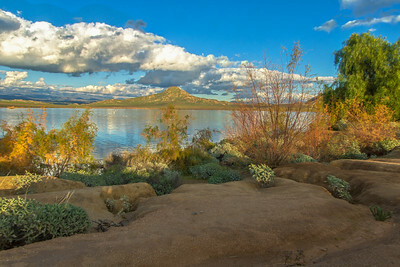 I captured five images of the lake and then stitched them together to make this Panorama. It is a 2.5-mile hike to the lake along Avalanche Creek. 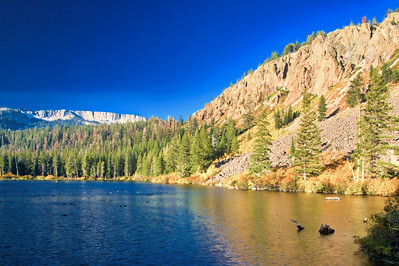 The lake sits at the base of 8694-foot Bearhat Mountain, which rises almost 4800 feet above the lake towards the northeast. The mountain dominating the view towards the south is 7886-foot Little Matterhorn. 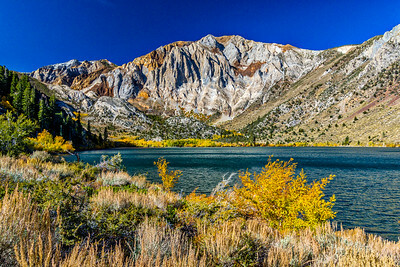 If you look closely at the cliffs and mountains that surround the lake you'll notice several long waterfalls cascading hundreds of feet as they make their way towards the lake. 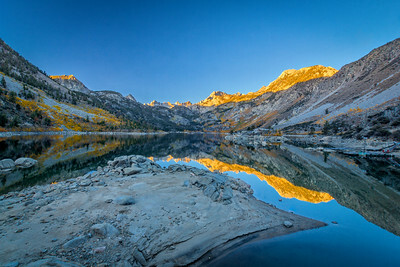 I captured this image of Lake Sabrina at sunrise with the fall colors surrounding the lake. 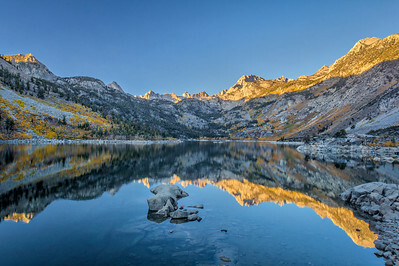 Lake Sabrina is a lake created by damming the middle fork of Bishop Creek. 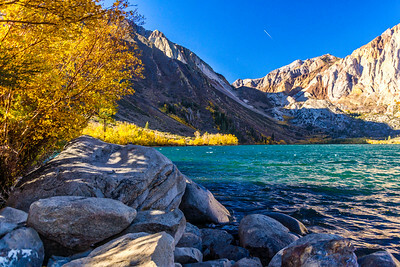 It is located south-west of Bishop, California in the Inoy National Forest in the Eastern Sierra Mountains at the 9,00 foot level. 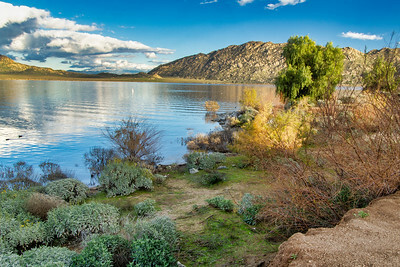 I did a photo shoot at Lake Perris with the snow-capped San Bernardino Mountains showing in the breaking clouds. 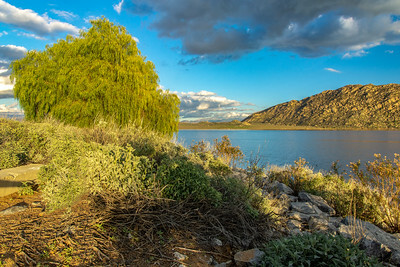 Lake Perris is situated in a mountain-rimmed valley between Moreno Valley and Perris, in what is now the Lake Perris State Recreation Area.